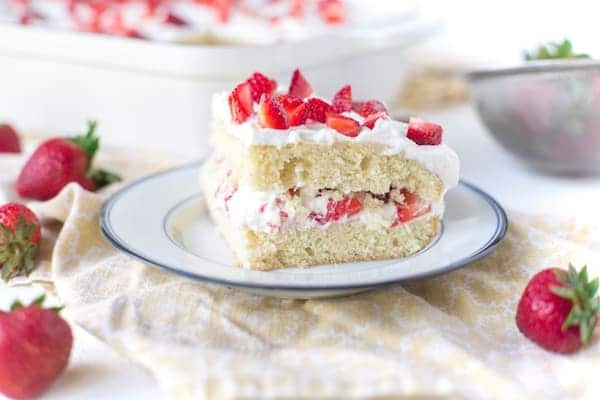 Summertime is the season for barbecues and potlucks and take one guess who always offers to bring the dessert? Yep, that’d be me. I love cooking for a crowd but I love baking for a crowd even more. 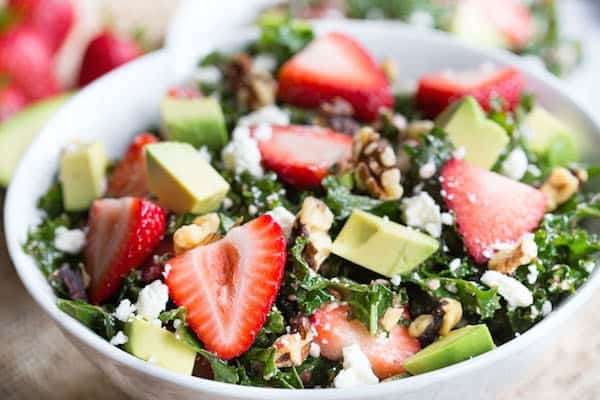 While pans of brownies and plates of cookies are great for barbecues, sometimes it’s fun to put together something a little fancier. Enter: trifles. 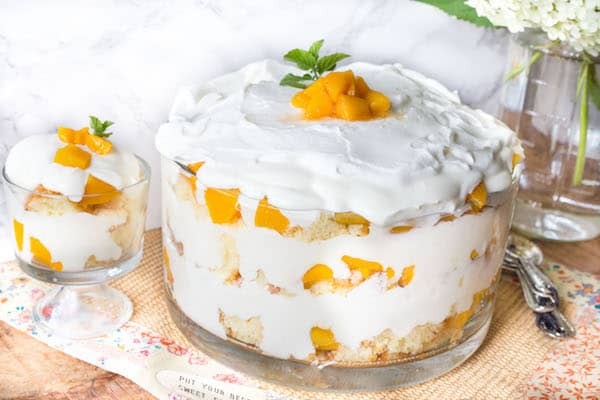 Specifically, this peaches and cream trifle. 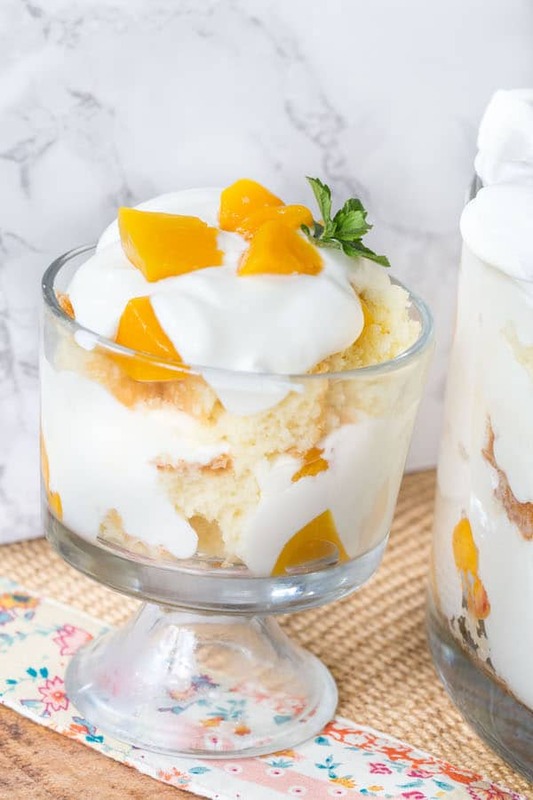 I know people love their bars here in Minnesota, but who wouldn’t enjoy a dessert with layers of white fluffy cake, luscious vanilla pudding, caramelized peaches, and whipped cream? A couple of things about this recipe. First, I went semi-homemade and used a box of cake mix for the cake. While 80% of the time I’m all about making things from scratch, I just feel like the boxed cake mixes are kind of hard to beat when you consider convenience and taste. Not many from-scratch recipes can get that fluffy texture and white cake taste and sometimes I don’t even care how the boxed mixes do it. So, cake mix for the win. The pudding, on the other hand, is 100% homemade and once you make this vanilla pudding you will never look back. It’s completely worth it and especially when you consider the very minimal hands-on time, it’s a no brainer. Also, there is homemade whipped cream (which is ridiculously easy so don’t even think about using stabilized whipped cream) which gets folded into the vanilla pudding making it super light, super fluffy, and insanely delicious. Like, I dare you not to lick the spatula. Lastly, while *technically* you could just use some canned peaches in this recipe if you’re short on time, you cannot go wrong with caramelized peaches. I mean, butter + sugar + peaches. C’mon now. These are the things summer is made of! 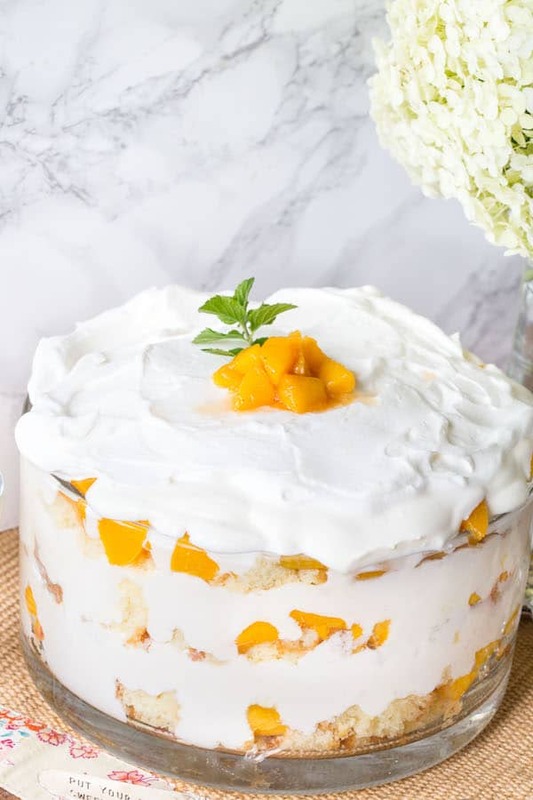 All together, this peaches and cream trifle is such a fun dessert for a crowd! 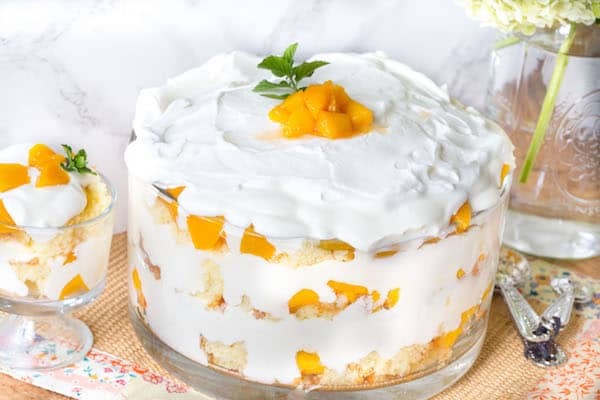 Not only does it look great in a glass trifle bowl, but it’s a great serve-yourself dessert. Just grab a spoon and dig in! Make the boxed cake according to directions on the package. Let cool completely. 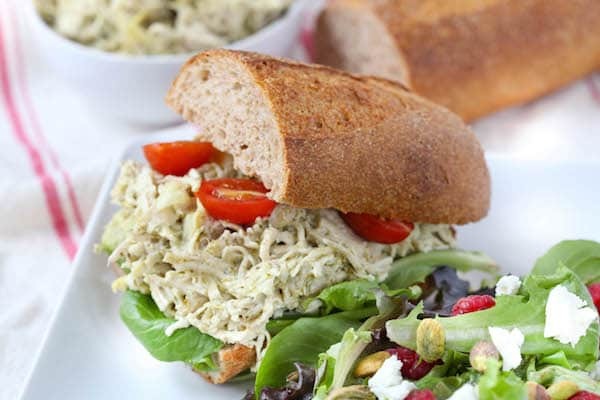 In a medium bowl, mix together ¼ cup of the milk and the egg yolks. Set aside. In a medium saucepan, add the remaining milk, sugar, cornstarch, and salt over medium heat. Stirring often, bring to a light simmer. Add ½ cup of the warm milk mixture to the egg yolks, whisking to combine. Add another ½ cup of the warm milk to the egg mixture another two times (three times total). This tempers the egg yolks so they don’t curdle. Add this mixture then to the remaining milk in the saucepan. Lower the heat to medium-low and continue heating another 4-6 minutes, stirring with a spatula, until it is thick enough that it covers the back of the spatula. Remove from heat and stir in butter and vanilla, stirring until butter is melted. Cover with plastic wrap, pressing it directly on the surface of the pudding to avoid it developing a skin, and let cool completely. Add peaches, sugar, and cinnamon, and cook over medium heat until peaches are softened and sugar is dissolved, about 7-8 minutes. Remove from heat. Next, prepare the whipped cream. 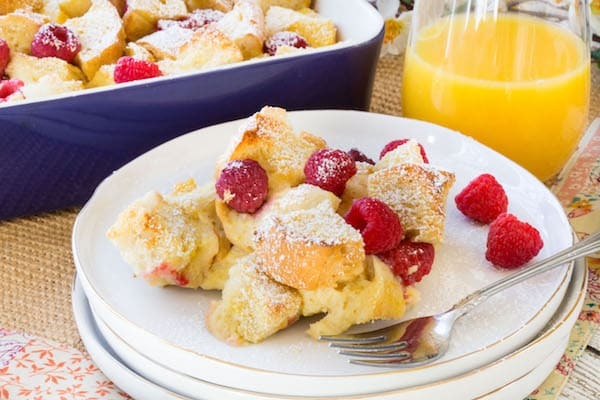 In a large bowl with electric mixer, add the heavy whipping cream and sugar. Whip on high speed until medium peaks form. Set aside 2 cups of the whipped cream. Fold the remaining whipped cream into the cooled pudding. Now it’s time to assemble the trifle. Cut the cake into thirds, then cut into bite-sized pieces. Layer a third of the cake on the bottom of your trifle bowl. Evenly spread a third of the peach mixture on top of the cake pieces. Evenly spread a third of the pudding mixture on top of the peaches. Repeat until three layers are complete, leaving a few pieces of peaches at the end for garnish. Garnish with peaches and mint.